Less than 10 more days before Samsung’s Unpack event scheduled for 14 March 2013, are you excited to see how the next Galaxy looks like and what specs would it pack under its purported 5” Full HD display? The specs of the Samsung Galaxy S IV has recently been leaked on @evleaks Twitter account, if you recall, evleaks have been pretty spot on with its leaks. The specs include a Full HD screen of unknown size, 16GB/32GB/64GB flavors, 2GBof RAM, 13MP rear shooter with Android 4.2 out of the box. Design wise, I can’t help but feel it looks very much like the first generation Galaxy Note – square and rather humongous. In fact, given how wide it looks, one can’t help but picture the LG Optimus Vu. The device also recently made its way to Antutu benchmark results, confirming several specifications that were leaked earlier like the Exynos 5410 processor at 1.8GHz with a 4+4 core setup. 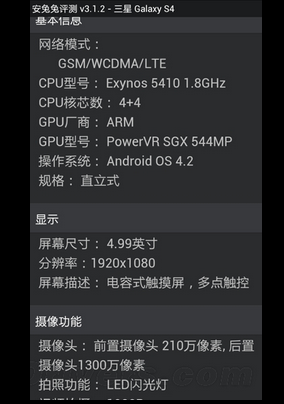 The specs on Antutu also revealed some similar specs including the 13MP camera, Android 4.2 OS, 2GB of RAM and the various storage capacities. As for something official, check out the latest teaser video posted by Samsung.